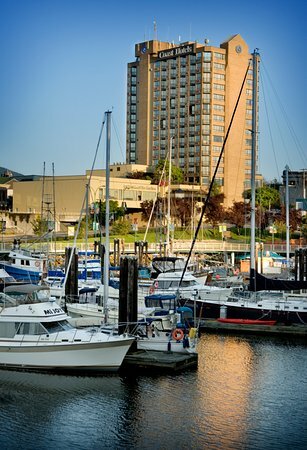 The Coast Bastion Hotel is located in the charming heart of downtown Nanaimo, near the ferry terminal and within walking distance to the seawall walkway, restaurants, bars and boutiques of all kinds. An amazing location that hosts spectacular views. The majority of Heritage BC 2019 Conference activities will be held at the Coast Bastion Hotel, 11 Bastion St, Nanaimo, BC. Book your room at the conference hotel today and stay close to the action! Book online or please call the Coast Bastion at 800-663-1144 and quote “Heritage BC” or group code CBI-GFC18709 to book under the discounted block. Nanaimo is equipped with two Ferry terminals offering service from the Vancouver area. Depart Horseshoe Bay in West Vancouver and arrive 1 hour 40min later to Nanaimo’s Departure Bay. Depart Tsawwassen and arrive in Duke Point, 15 minutes south of Nanaimo just 2 hours later. We recommend reservations as traffic can be high. Onboard enjoy food, shopping and a playroom for kids. Please visit their website. The Nanaimo airport is home to three air carriers – Air Canada, WestJet and Island Express. Flights to and from Vancouver, Calgary, Abbotsford Boundary Bay and Victoria. Located just 18km south of Downtown Nanaimo, the airport offers shuttles, taxis, rental cars as will as short and long term parking. Please visit their website. Regularly scheduled Float Planes depart from Downtown Vancouver and Vancouver International Airport (South Terminal). These are offered through Harbour Air Seaplanes, Sunshine Coast Air and Seair Seaplanes. Flight time is approximately 20 minutes. On This Spot: Nanaimo – We are proud to announce “On This Spot” as our Title Sponsor. The On This Spot app takes people on guided walking tours through the history that surrounds them.